> Beads>Glass beads>Brown glass beads>Czech glass large hole bead, tortoise shell brown. Pack of 10. 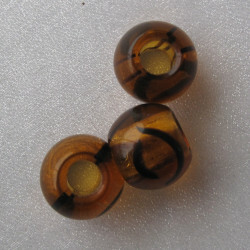 Czech glass large hole bead, tortoise shell brown. Pack of 10. Czech glass large hole bead, tortoise shell brown, approx size 12.3 x 9.7 mm. Pack of 10.